“Night School,” which opens on Sept. 28, 2018 and is rated “PG-13,” also stars Brooke Butler, Keith David, Taran Killam and Anne Winters from director Malcolm D. Lee and writers Kevin Hart and Harry Ratchford. To win your free passes to “Night School” courtesy of HollywoodChicago.com, just get interactive with our social media widget below. That’s it! This screening is on Tuesday, Sept. 25, 2018 at 7:30 p.m. in downtown Chicago. The more social actions you complete, the more points you score and the higher yours odds of winning! Completing these social actions only increases your odds of winning; this doesn’t intensify your competition! Deadline: Entries can continue being submitted through Monday, Sept. 24, 2018 at 5 p.m. CST. These Hookup winners will be awarded via e-mail on that date. Star Kevin Hart and producer Will Packer, who partnered for the hit “Ride Along” and “Think Like a Man” series, bring their signature style to “Night School”. The comedy from director Malcolm D. Lee (“Girls Trip”) follows a group of misfits who are forced to attend adult classes in the longshot chance they’ll pass the GED exam. Co-stars Tiffany Haddish, Rob Riggle, Taran Killam and Romany Malco join Hart for the film that Hart produces for his Hartbeat Productions and Packer via his Will Packer Productions. 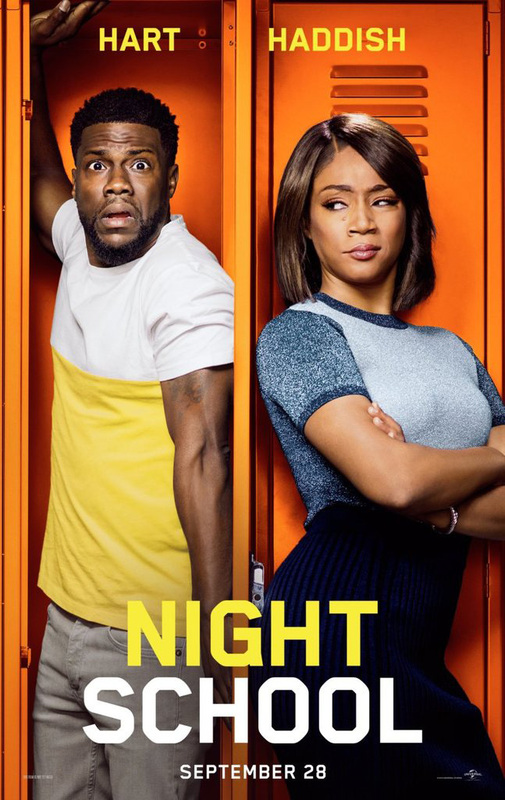 The movie poster for “Night School” starring Kevin Hart and Tiffany Haddish. This HollywoodChicago.com Hookup is simple! Just get interactive in our social media widget above. We will award 40 admit-two movie tickets based on social entry numbers and/or randomly via e-mail for our “Night School” Hookup. Good luck!